is hosting a fabulous giveaway worth at least $25. You can hop through the list and enter every one of them! To enter, just fill in the Rafflecopter form below. You must be at least 18 years old and reside in the USA. Only the first entry is mandatory; but you can earn bonus entries too! Giveaway ends at midnight on 1/20/2014. Good luck! Now go see what else you can win! Disclaimer: Participating bloggers and hosts are not responsible for sponsors who do not fulfill prizes. I like the EcoStorage Shower Caddy. I could certainly use the TRINITY EcoStorage™ Wire Drawer w/Slides - Chrome-I might even be able to find things in my pantry if I had a couple of those! I love the outdoor coolers - how nice it would be to have one of those this spring and summer! I like the TRINITY EcoStorage Closet Organizer. I like the TRINITY EcoStorage 3-Tier Cart - Chrome. I love the heavy duty wire shelving racks. I already have one for my pantry and would like a couple more for laundry room etc. I could use TRINITY EcoStorage™ 2-Tier Wire Drawer w/Slides - Chrome, maybe 2 of them. oh wow the closet organizer may actually give me a closet that is functional! the shelving would be nice additional space fr bathroom. It doesn't allow much room. sorry I hit follow button on twitter for sponsor before I meant to. Pleasse disregard. I like all of the kitchen shelving choices and all so reasonably priced. Decisions, decisions. I love the ecostorage closet organizer. I would save a lot of space having that. 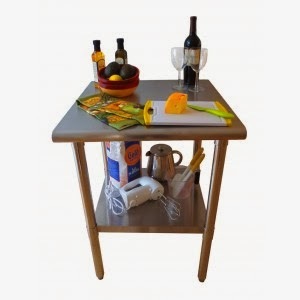 I like the TRINITY EcoStorage™ 48" NSF Stainless Steel Table w/ Wheels. This would be great in our kitchen. My husband would love these for our home - TRINITY 5-Tier NSF 60" x 24" x 72" Heavy Duty Wire Shelving Rack w/Wheels - Chrome! I love their closet organizer. I sure could use a couple of them. I love the TRINITY EcoStorage™ 4-Tier NSF 48" x 18" x 72" Wirerack! I like the TRINITY EcoStorage™ 4-Tier NSF Corner Wire Shelving Rack w/Wheels - Chrome! I like the versatility of the outdoor shelving rack. Being able to move it anywhere is a major plus for me! I love their wire shelving racks. I could really use those for my pantry! I learned EcoStorage™ items are environmentally friendly both in material and in production. EcoStorage™ items are environmentally friendly both in material and in production. I like the aluminum work stool for the garage. My son in law is always taking the kitchen table chairs into his greasy garage. I like their wire shelving racks. I need to get more organized in 2014! I like the TRINITY EcoStorage 5-Tier NSF 48" x 18" x 72" Wire Shelving Rack. I love the TRINITY EcoStorage™ Wire Drawer w/Cover - Chrome. i am always looking for storage baskets. I learned that Trinity complies with NSF standards and "NSF is the only third-party testing organization to undertake a complete evaluation of every aspect of a product's development before it can earn our certification." I also like the Trinity Eco Storage 3 Tier Chrome Cart. I really like the Trinity stainless steel beverage cooler, this would be great for parties! I learned that NSF certifies food service equipment and ensures it's designed and constructed in a way that promotes food safety. I really like the TRINITY EcoStorage™ 4-Tier NSF Corner Wire Shelving Rack w/Wheels - Chrome. I also like the 6 tier shelving units for the garage. They look like they could hold quite a lot of stuff. I love the TRINITY Stainless Steel Beverage Cooler. That is so cool! I really like the TRINITY EcoStorage 4-Tier NSF Corner Wire Shelving Rack w/Wheels. It would be perfect to put in my laundry room for some extra storage. Thank you. One item I particularly like is TRINITY's EcoStorage Bamboo Kitchen Cart. I love the shower storage caddie! I like the TRINITY EcoStorage 5-Tier NSF 48" x 18" x 72" Wire Shelving Rack - Chrome. I also like the Trinity stainless steel tool chest! My husband needs some organization in the garage! TRINITY 5-Tier NSF 48" x 18" x 72" Outdoor Wire Shelving... is something I would love to use as a plant stand! I like the TRINITY EcoStorage 6-Tier NSF 48" x 18" x 72" Wire Shelving Rack w/Wheels - Chrome. I like the wire shelving racks. I like the TRINITY EcoStorage Shower Caddy. I'm in the midst of post holiday organizing, so I'm seeing lots of stuff I like. The corner shelving rack would be so useful! I like the TRINITY 5-Tier NSF 48" x 18" x 72" Outdoor Wire Shelving Rack w/Wheels - Gray. This would go perfect in my back yard with all my plants. I desperately need this in my kitchen. I like that their site states "EcoStorage™ chrome color finish is achieved without releasing any toxic chromium into the environment"
I like their wire shelving racks. I like the trinity 5 tier nsf 48*18*72 outdoor wire shelving. I really like the TRINITY EcoStorage Shower Caddy. I like the Dual-Sided Mobile Bin Rack, it would really clean up our garage. I like the TRINITY EcoStorage™ 6-Tier NSF 48" x 18" x 72" Wire. I like the 3 tier storage cart. I could really use several of the TRINITY 4-Tier NSF 48" x 18" x 72" Wire Shelving Rack in my garage! I really like the TRINITY 29" Chrome Swivel Barstool - Black. Thanks! I love the collapsible crates! What a cool idea! Thanks for the chance! I like the garage shelving racks. I really like the TRINITY 29" Chrome Swivel Stool - Black (2 Pack). It's time to add some shelves to my garage! I like the 6-tier wire shelving rack with wheels. I like the stainless steel beverage cooler and found out their products can be found at Costco. I really love the TRINITY EcoStorage™ 48" NSF Stainless Steel Table, I could use it as my new craft table! I like the TRINITY EcoStorage™ Baker's Rack! my husband would love the 27" stainless tool chest!!! I like the EcoStorage Closet Organizer. I really like the chrome EcoStorage™ 2-Tier Wire Drawer w/Slides on their site, great storage solution! I like the 4-Tier NSF Corner Wire Shelving Rack with Wheels. TRINITY EcoStorage™ Wire Drawer w/Slides would be a really cool thing to have. I am a terrible organizer and the sliding wire drawer would really help keep things more 'in their place'. We could use this: TRINITY 5-Tier NSF 48" x 18" x 72" Outdoor Wire Shelving Rack w/Wheels - Gray to organize all of our outdoor tools and toys on our patio. They donate to non-profit organizations in need! I like the Trinity EcoStorage Bamboo Kitchen Cart in Chrome. Thank you for the super giveaway opportunity. Keep up the terrific blogging. I absolutely LOVE their EcoStorage Wire Baskets! I could use lots of those to organize my pantry and even my boy's playroom! They look wonderful! I like the TRINITY EcoStorage™ 6-Tier NSF 48" x 18" x 72" Wire Rack. I love the Bar Stools, very retro! And maybe a third one in the kitchen - for me! I'd like to have the TRINITY 27" Stainless Steel Tool Chest for all the tools laying around my house. Also loving the TRINITY 29" Chrome Swivel Stool - Black (2 Pack)! They are about social responsibility. They help the community and give back. It makes it easy to give because they have a donation form on the site. i like the TRINITY 17.5 Quart Collapsible Crate for bathrooms. This is perfect and just what i need. I could use the sliding wire baskets! They'd be perfect for my pantry. TRINITY EcoStorage™ Closet Organizer looks extremely spacious, and I think it would be a great way to get my closet organized. I really like the EcoStorage Baker's Rack. Very nice! I would also like to have the TRINITY EcoStorage™ Baker's Rack. I like the TRINITY EcoStorage™ Baker's Rack. Ever on the lookout for yet MORE ways to store my books, I headed right to the "storage" category. Books are HEAVY, so I'd definitely go for the 5-tier heavy-duty shelving here: http://shop.trinityii.com/shelving-racks/29-trinity-5-tier-nsf-60-x-24-x-72-heavy-duty-wire-shelving-rack-w-wheels-chrome.html Thanks for the chance to win! I like the trinity quart collapsible crates. I have and love the TRINITY 5-Tier NSF 60" x 24" x 72" Heavy Duty Wire Shelving Rack w/Wheels - Chrome. I want the TRINITY EcoStorage™ Closet Organizer. I like the TRINITY Stainless Steel Beverage Cooler. Thanks. I really like the large bins and collapsible crates. Great storage items! Bakers rack and bamboo cart... I do so WANT!! We could definitely use the TRINITY EcoStorage™ Baker's Rack in our kitchen! I really like their wire storage racks. TRINITY EcoStorage™ Bamboo Kitchen Cart - Chrome. Its very nice that they donate to charity and provide a donation form. Very nice! Besides the prep table offered in the giveaway, I would love to have the 5 tier Trinity outdoor shelving unit. I love the TRINITY EcoStorage™ 2-Tier Wire Drawer w/Slides - Chrome. Hello, I learned that Trinity has many storage items and every item every day comes with free shipping. Thanks for a great giveaway! I learned they have items to fit your every need or use. Would love the TRINITY EcoStorage™ 6-Tier NSF 48" x 18" x 72" Wire Shelving Rack w/Wheels - Chrome at http://shop.trinityii.com/shelving-racks/12-trinity-ecostorage-6-tier-nsf-48-x-18-x-72-wire-shelving-rack-w-wheels-chrome.html. Actually I could really use two of them. Thanks for the giveaway. I learned Trinity has a solution for storage for every space in the house. I love the TRINITY ecostorage closet organizer. You should see my closet! I could use it! I would love to have the TRINITY EcoStorage™ Bamboo Kitchen Cart - Chrome. I love the EcoStorage wire baskets with cover. Lovin the TRINITY EcoStorage™ 48" NSF Stainless Steel Table. Awesome for the kitchen,laundry room or garage!! I would love to also try the TRINITY EcoStorage™ Shower Caddy! Shower storage is always a struggle. I like the TRINITY EcoStorage Wire Basket w/Slides-perfect for my tiny kitchen! I like the ecostorage bakers rack! TRINITY Collapsible Crate - Combo Pack. These would really be wonderful. I sometimes sell at flea markets. After I either have to find a way to store my totes or start out by using something that will end up in the garbage. Cindy B (on rc/fb) they have all kinds of neat items including bar stools. i really like the TRINITY EcoStorage™ Shower Caddy, it appears to be good quality, and Trinity's prices are very reasonable, thank you! I really like the TRINITY Stainless Steel Beverage Cooler. It would be great for parties.